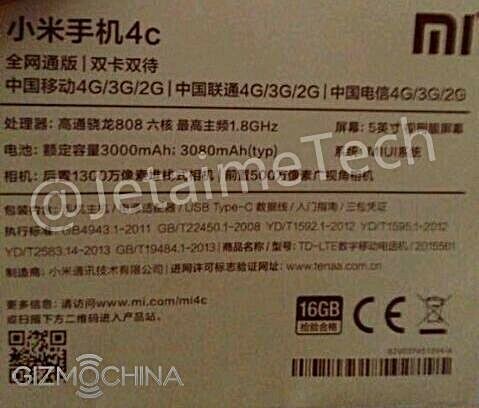 The Xiaomi Mi 4c smartphone - which was spotted at TENAA over a week ago - has been the subject of another leak, this time in the form of an image showing the back of the box. It confirms pretty much all the specifications of the device. As can be seen in the image above, the handset is powered by a Snapdragon 808 SoC, and sports a 5-inch 1080p display. It comes with 2GB RAM and 16GB internal memory, and packs a 3,080mAh battery. It is being said that a 32GB model is also in the works. In terms of camera, the Mi 4c features a 13MP rear unit and a 5MP front shooter. It comes with a USB Type-C connector and reportedly runs the company's latest MIUI 7 mobile OS. As for the price, although there isn't any confirmation, the device is said to cost around CNY 1,299 (~$200). Does it have SD card support? The SD810 on OPT isn't performing like a champ either. Who knew downclocking would kill that CPU.